Is there anything more ironic than conservative legislators making it possible for Satanists to erect a monument outside their state capitol building? 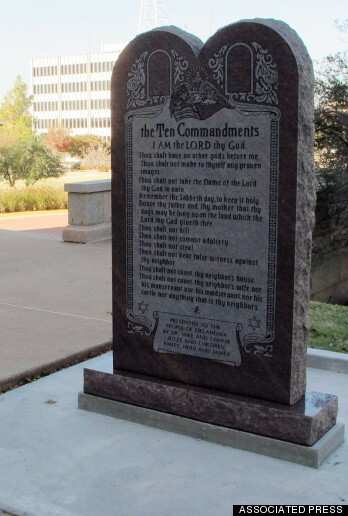 In 2009, the Oklahoma legislature authorized a privately funding monument of the Ten Commandments be placed outside the Oklahoma capital building. The legislators approved the monument as a tribute to “Judeo-Christian heritage.” The monument was erected in 2012 and was immediately challenged by the ACLU as an infringement of the Establishment Clause of the Constitution. If the ACLU were the only challenger, this would hardly be an unusual story. The interesting part is that a New York-based Satanist group wants to place their own monument next to the monument of the Ten Commandments. In other words, the Oklahoma is facing the ACLU, who wants the state to take down the monument, and the Satanist group that wants to add a monument. In a letter that can only be described as provocative, the Satanist group promised that their proposed monument, which will involve a pentagram, would be in “good taste and consistent with community standards.” Given that the Satanists are also talking about including an interactive display for children, which would make the monument more than just a big rock, it’s safe to assume that the Satanists are making fun of the legislators. Realistically though, the Satanists don’t have much of a case. First, the Satanists are from New York; it’s questionable whether they even have standing to bring a lawsuit in Oklahoma. Second, the Supreme Court has already ruled in 2009 that governments are free to decline privately funded monuments as government speech. The most important thing about the Satanists is that if Oklahoma rejects the Satanist monument, they will strengthen the ACLU claim that the Ten Commandments monument is a state endorsement of certain religions over others. Although one Oklahoma legislator believes that Satanists are “a different group” in the “nut category,” government officials should not be in the business of deciding whether a belief system qualifies for religious protection or not. The Satanist group in this case might not be a very good test case, but let’s not forget that Christianity in the Roman Empire was initially just “a different group” that Roman officials believed were nuts. Thank you for your comment! I agree that any case the satanists would be a weak one, but for the reasons I gave in the blog (state governments can decline private monuments). I assume that when you talk about a “christian nation” you mean what the founding fathers intended. If the founding fathers intended for this to a christian nation though, why didn’t they put it in the Constitution? Instead, they put the Establishment Clause in the Constitution, which forbids the government from making America into a christian nation. At most, a government could declare that they are friendly to all religions, not just Christianity. But that was the point the satanists were trying to make, even if everyone thinks the satanists are nuts.